Asturias is one of the seventeen autonomous communities of Spain, and can be found in the far north of the country. Many of the autonomous communities of Spain are further sub-divided into provinces and Asturias is no exception albeit there is only one province in this region, which is also named Asturias. The capital of the province, Oviedo along with the seaport of Gijón and the industrial town of Avilés are the most important cities of the region with other major towns including Mieres, Siero, Cangas de Onís, Cangas del Narcea, Grado, Lena, Laviana, El Entrego, Villaviciosa and Llanes. High mountain ranges spanning some 200 kilometres, characterize the landscape of Asturias and within these ranges some of Spain's most exceptional nature reserves, such as Picos de Europa and the national parks of Covadonga and Somiedo, can be found. As extensive as it is spectacular, the Asturian coastline is littered with hundreds of beaches, coves and natural sea caves. Playa del Silencio (Beach of Silence) close to the fishing village of Cudillero and the many, many beaches, which surround the summer resort of Llanes, are particularly noteworthy. Barro, Ballota and Torimbia (which is predominantly a nudist beach) are just a few of these and it is not unusual to see grazing livestock on top of the steep cliffs which border most of the fine, sandy beaches. With an annual rainfall varying between 1m and 1.5m, the province can claim to be one of the wettest in the Iberian peninsular and Degaña, with its average of 2.13m per year is one of the wettest areas within the region. 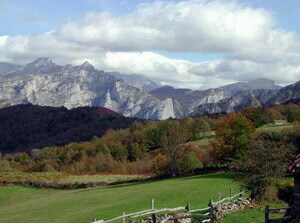 The mountainous areas of Asturias have, predictably, harsh and bitterly cold winter periods, whilst in contrast, the coast enjoys mild summers and winters with yearly average temperatures in Oviedo being 13ºC. Snowfall is commonplace in the Somiedo and Picos regions between November and January. Asturias is renowned for both its seafood and for its regional dish Fabada Asturiana, which is a rich, tasty stew made with large white beans, shoulder of pork, black sausage, spicy sausage and saffron. The traditional alcoholic drink of the region is a natural cider made with apples harvested from the many apple groves here and it is usually served "El Escanciado". The bottle, when using this method, must be held above head height, which allows the cider to have a long vertical pour, and since it is bottled without gas, the cider becomes aerated as it splashes into the glass giving it a pleasant, refreshing taste. It is customary to pass the same glass around and for everyone to drink from it. After each person takes his or her sip, a small amount of the cider is splashed to the ground in a symbolic glass cleaning gesture before passing it to the next person. Asturias is also affectionately known as "the land of cheeses". This is due chiefly to the wide variety and quality of the regions famous product (especially the Cabrales). The Way of Santiago (along with all of its en-route monuments) and the Ruta de la Plata (the "silver route") both traverse Asturias and are some of the regions most favourite tourist attractions. Regional Anthem - The regional anthem of Asturias, 'Asturias, patria querdia' (Asturias, my dear motherland), is a song which, as popular myth suggests, is sung by intoxicated people across the whole of Spain, whereas in reality this is not actually true. Francos' side first mentioned this idea during the Spanish civil war in an effort to damage the reputation of the Asturian people. Oviedo, the region's capital: compromising of a diverse architecture, it is a clean and cosmopolitan city. Some of the major highlights located to the north, are Santa María del Naranco and San Miguel de Lillo, a pre-Roman church and a pre-Roman castle respectively, which were built by the first Asturian Kings. The Picos de Europa National Park: The Picu Urriellu is probably the more famous of the mountains in this range and is a molar-shaped peak which has an orange radiance in the twilight sun which gives it its nickname of 'El Naranjo de Bulnes'. The shrine to the Virgin Mary of Covadonga and the mountain lakes near Cangas de Onís: The Virgin Mary is said, according to legend, to have given Asturian soldiers a timely signal to attack the Moorish conquerors, which by doing so took the aggressors completely by surprise. The result is that the Reconquista and unification of Spain, it is believed, began here in Asturias. The Asturian coast: the beaches and coves around the resort of LLanes are worthy of particular mention, as is the Playa del Silencio close to the fishing village of Cudillero. Ceceda village: notice the traditional horreo grain silos, which are built on stilts which keeps field mice from getting to the grain. The Dobra River: its remarkable colours and natural beauty make the river worthy of visiting if you are in the area. The 'senda costera' (coastal way) between Pendueles and Llanes: some of the most impressive coastal scenery can be seen whilst walking along this nature route. Among the many spectacles are the bufones (water spouts naturally created by sea erosion) and the Playa de Ballota. A bizarre rock formation on the beach at Buelna village that is best viewed at low tide. The mountains and nature reserves of Asturias offer a timeless way of life, which is steeped in culture and is enchantingly different from the busy Southern Costas. At least once in a persons life a visit to Asturias should be on the agenda. About the Author - Written by Mark Buckingham, Managing Director of Rentaccomspain.com, an online resource where you can find a wealth of Spanish property for rent and for sale.